This stew couldn’t be simpler to make – all the ingredients simmer away to produce a dish that is really big on flavour and amazingly tender. In a large, heavy-based pan, arrange all the ingredients (except the stock and thyme) in layers and season generously. Pour in the hot lamb stock and bring to the boil. Skim off and discard any scum that comes to the surface. 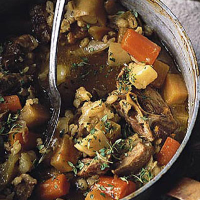 Once boiling, reduce the heat to a gentle simmer and cook for 3 hours, stirring occasionally – making sure that the mixture doesn’t catch on the base of the pan – until the vegetables are cooked and the chunks of lamb very tender. Serve sprinkled with chopped fresh thyme, and hunks of crusty white bread. This recipe was first published in Thu Jan 01 00:00:00 GMT 2009.